I “edited” some of the ATC’s from the last post. Then I took the plunge (gulp) and made some in black and white photos to see what would happen with them. I’m VERY pleased with the black and white. The wax has a honey color that adds a vintage patina look to the card…I think it’s quite wonderful. 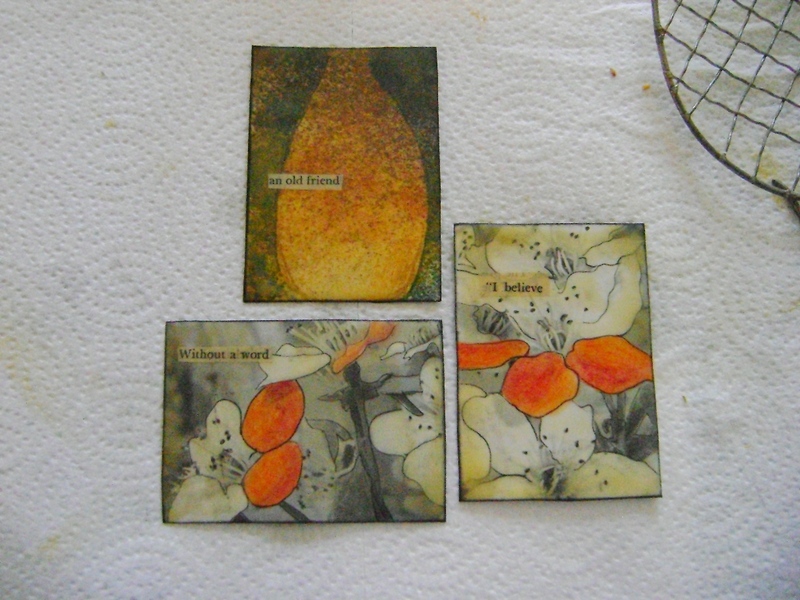 I played with beeswax again with a friend this week. We used the wax that I bought from honey producers. 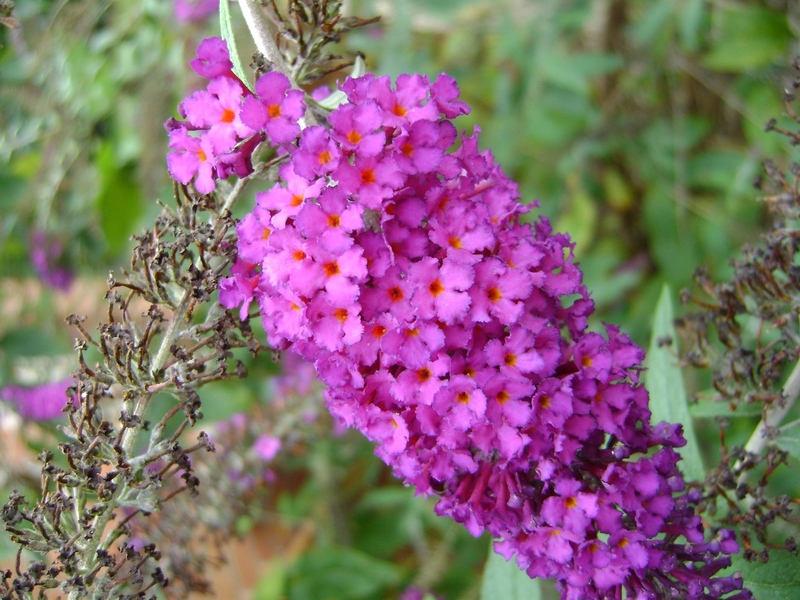 My, my, what an enchanting smell! There was a new Cloth Paper Scissors issue out with a technique using plexiglas. Lynda wanted to try that so we did. You can see our results here on Lynda’s blog, Bloom, Bake, and Create. Neither one of us were terribly impressed, but perhaps that is just due to our lack of experience with the technique. 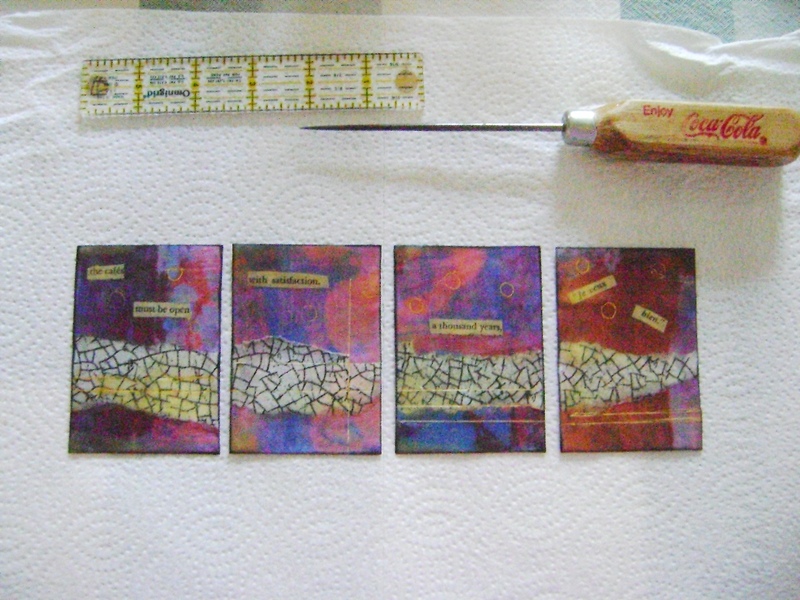 However, I wanted to have a go at it again, this time using some ATC sized bristol board pieces. I cleaned in My Room yesterday and found I had bunches of ATC size packs that absolutely needed be used. 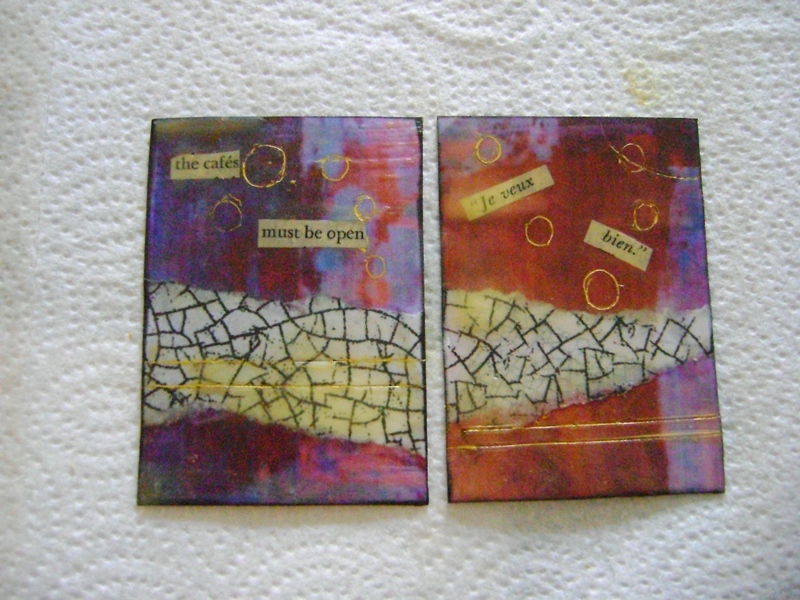 Yesterday I watched Amy Stoner’s dvd on using collage and wax. Now I’m armed and ready. 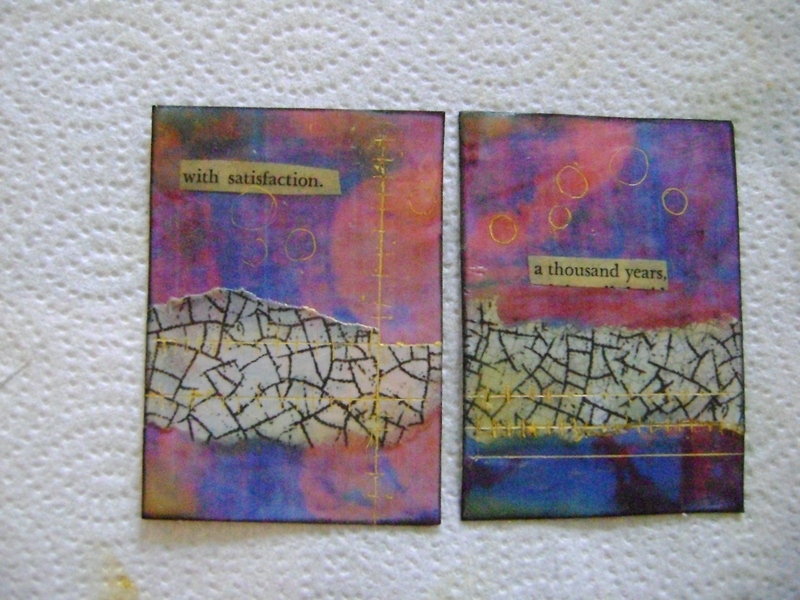 I made the collages last night using 100 lb. 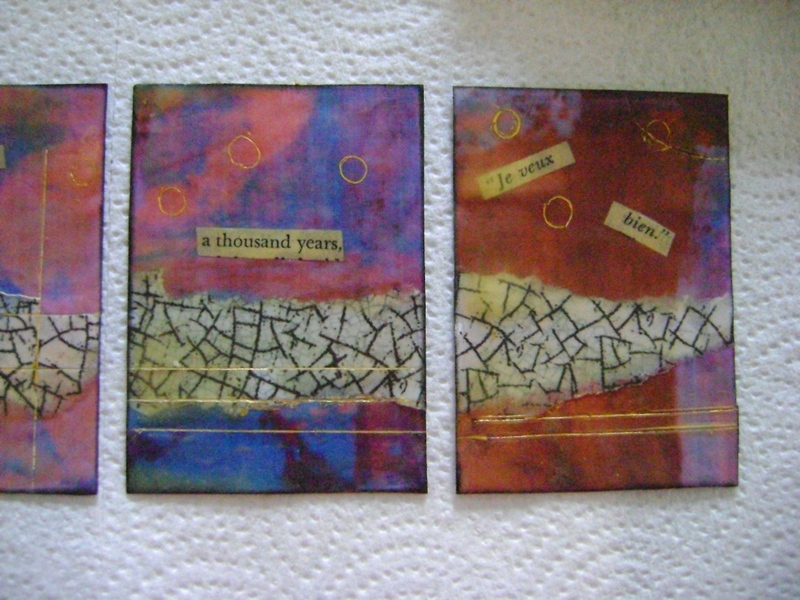 Bristol board, prints on copy paper and words clipped from an old book. First I glued the paper pieces down, then I inked the edges with a black ink pad, just like Amy did. Let that dry and this morning I am getting the wax out. I used the ice pick to incise some lines and free hand circles in the wax, then I used a gold paintstik to rub paint into the lines before sealing them. There is more that could be done with the ice pick and just maybe I will. I think I could get addicted to this. 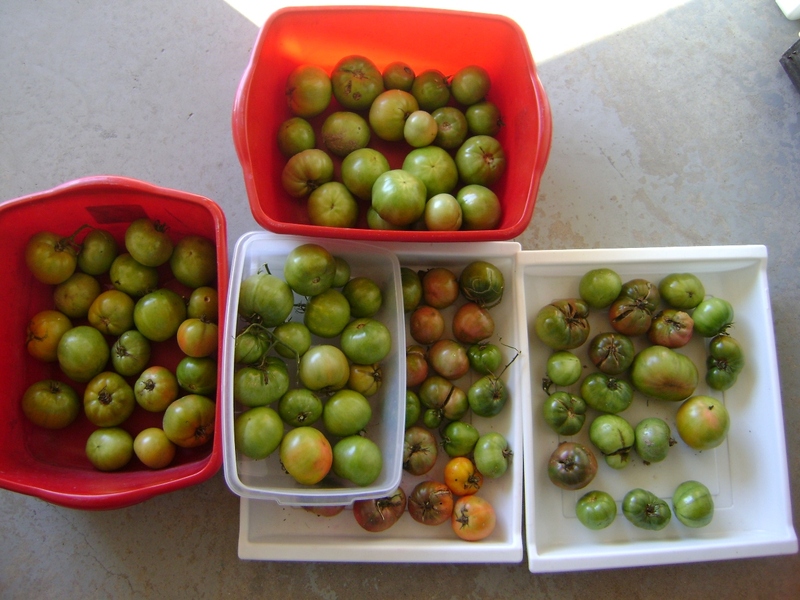 Yesterday it was rapidly ripening tomatoes I had to deal with…..
….so I made a big pot of fresh tomato soup. With a little bit of cream, it was so good. 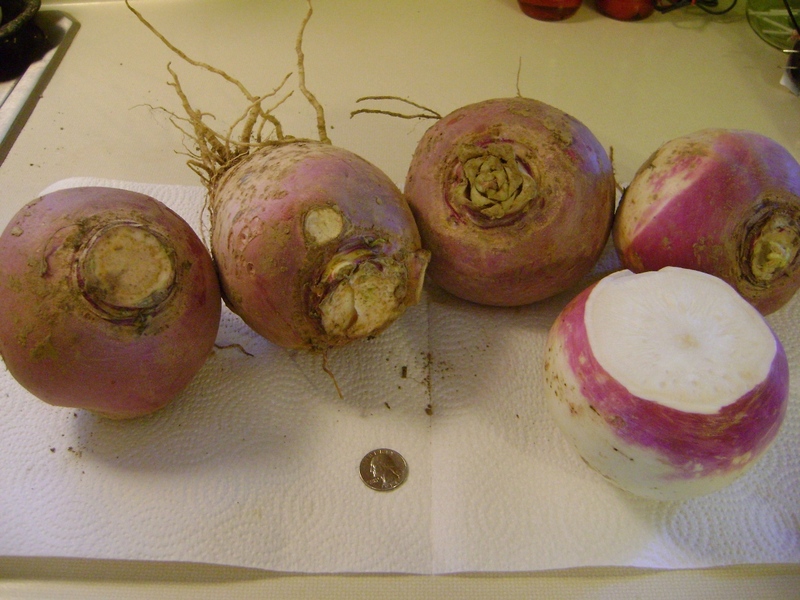 Today it is turnips. Someone gave these to us…and look at the size of them! I have to quarter them to be able to peel them. I would rather be in the studio! I have ornaments to make and art. 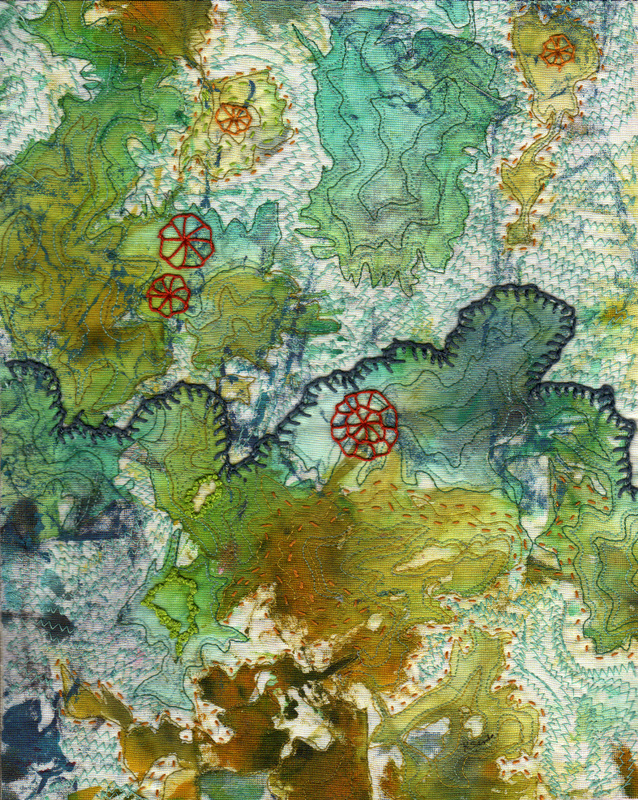 I did finish Flow #9 yesterday and today and it is ready for framing. I posted a photo on FB, but I decided it needed one more thing. 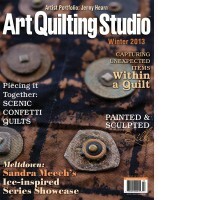 Flow #9 has all kinds of stitching delight for those who want to come closer…. 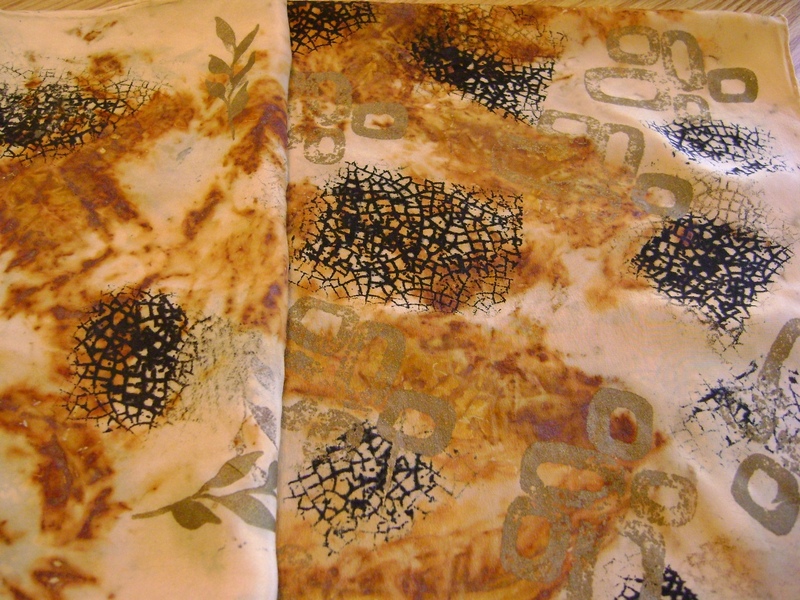 I think I can see the actual threads in the cloth on this…I scanned it instead of photographing it. That probably made the difference. If you don’t follow me on Facebook, the new news is that the first Flow in the series sold at my exhibit this past weekend. It was framed and behind glass. It was a different size than others in the series. 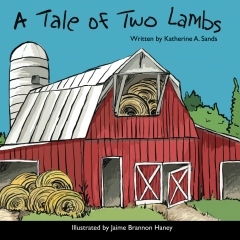 You can see it on the sidebar here on the blog. All of the others are mounted on 12 inch canvases which have been covered with a soft gray Kona cotton before mounting the art. I pondered whether the reason this one sold is due to the presentation of it versus the others. Contact with the buyers revealed that they found it hard to choose which one to purchase so maybe it didn’t make any difference. I will frame this one as it is a little larger than the others and will not mount comfortably on the 12 inch canvas. 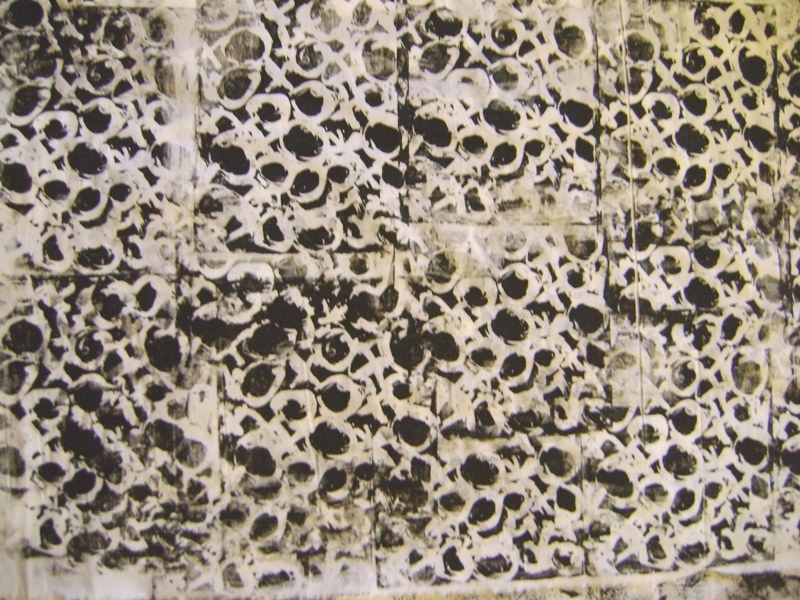 The opening reception for Surface Matters is rapidly approaching on November 19th. It is Saturday morning. I have been sick a few days this week, but am much better today. This has been a short cold…thanks to whoever has been praying for me. It has slowed me down on my work however. I have not gotten much done for the exhibit which starts 2 weeks from YESTERDAY. So this morning I am dyeing some fabric since a customer will be in the area next week and needs some. And since I am dyeing, I am dyeing a special order scarf. At the same time I am trying out some new soup recipes. I fixed a boneless turkey roast yesterday and my usual recipe for leftovers is turkey tetrazzini which we love, but is that all there is? So this a.m. I was googling for recipes and came upon two that I decided to try. One is turkey barley soup. While DH doesn’t particularly care for barley (like how much taste is in the stuff anyway? ), I made a small batch of it to try. It is very good. The other one is a creamy turkey soup with rice in it. And while it doesn’t call for wild rice, I put a handful of it in with the Basmati rice. I usually keep wild rice cooked and in the freezer for a certain wild rice bread that I adore. I was really wanting to make a chicken and wild rice soup this week, but didn’t have the requisite green onions and pimientos to make it, so I scratched the idea. The turkey rice soup was the perfect opportunity to throw in some wild rice. There is nothing like wild rice. I love it. My husband will get a soup smorgasbord tonight for supper. Maybe I need to make some homemade bread too, eh? 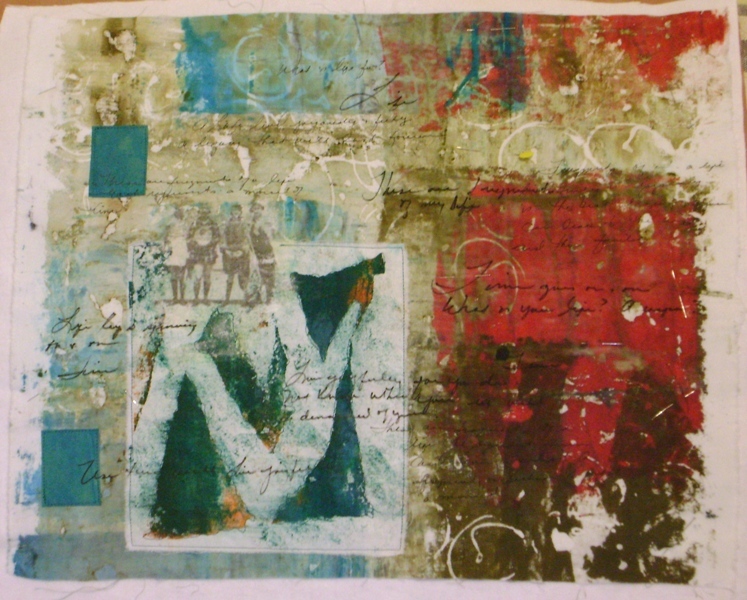 This afternoon my plan is to get a new mixed media piece stitched. I planned on getting two pieces collaged this week in preparation for stitching, but due to how AWful I felt, I only got one done. Now I need to stitch it before I can start any painting and drawing on it. Ummm…trying the new creamy turkey and rice soup now…delicious! Facebook is still denying me the ability to upload photos, so I will post more here and link to there. This one is a photo of the Bradford pear tree that we used to have. 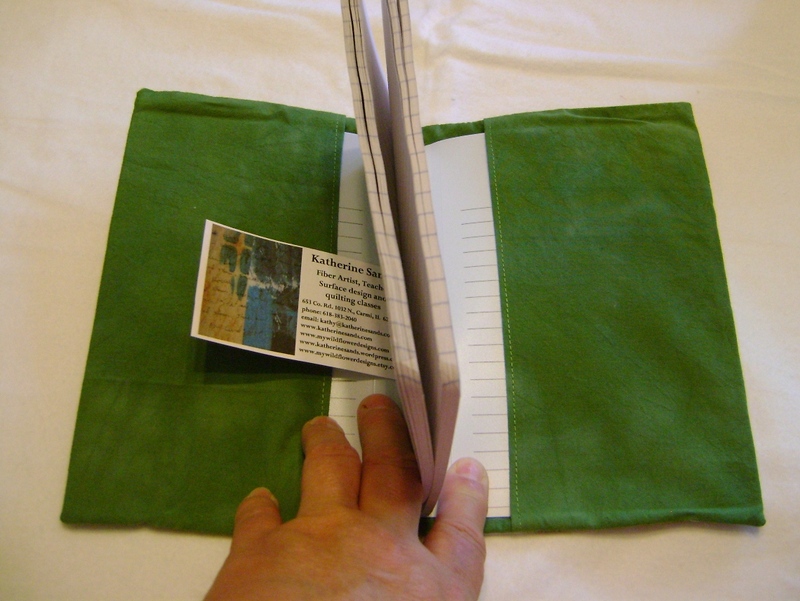 It has inside pockets to hold the book and they are made with a green hand dyed (by me) fabric. I have stitched a little bit around one of the blooms on the front and there is a black rubber strap to accent and hold the book. 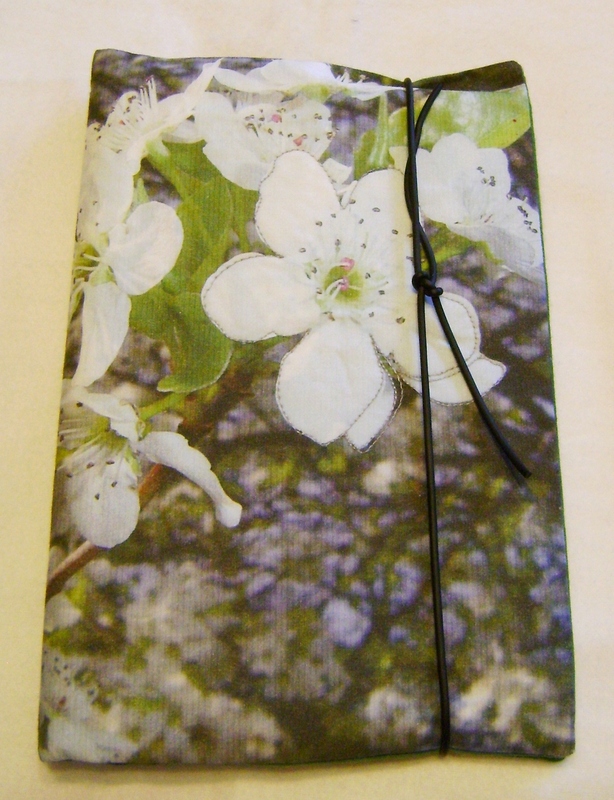 The journal inside is a Mead composition book in 5″ x 7″ size and is easily replaced when needed. The cover is washable. 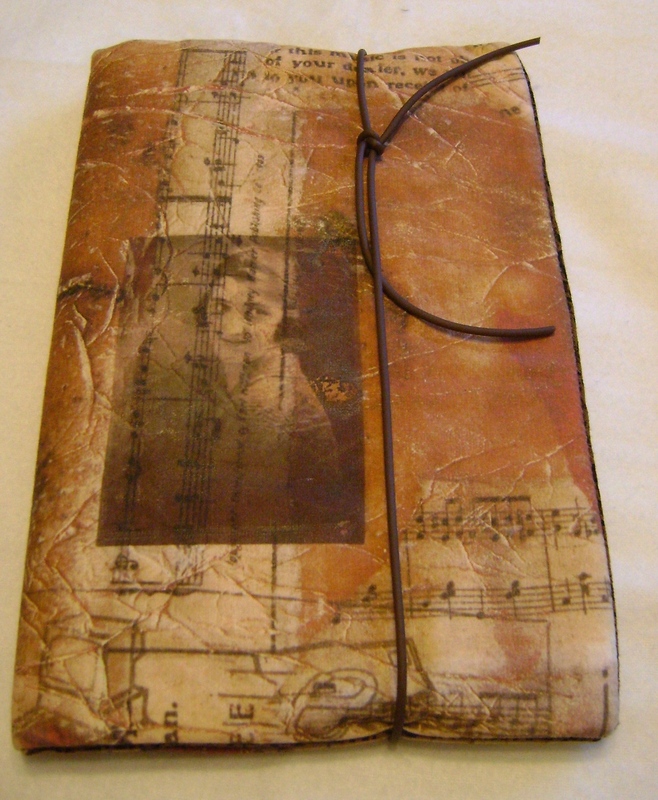 This journal is $17 plus $2 shipping. In Illinois there is a 6.25% sales tax charge also if you are an Illinois buyer. Contact me by comment or email to make purchase arrangements. Facebook is being mean to me. It won’t let me upload photos from my hard drive. I have small journals for sale. 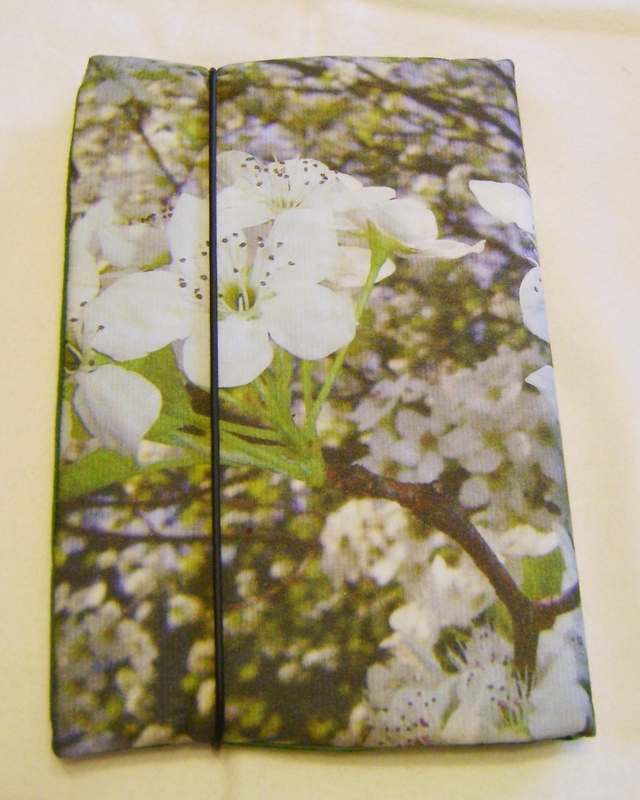 The covers are made from my photos…photos of nature and photos of the cloth and paper cloth that I make. 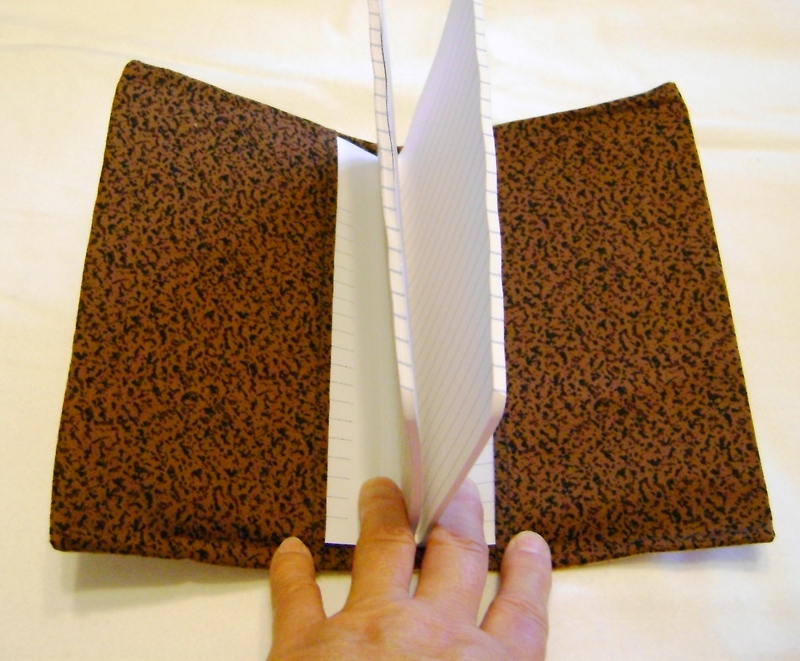 The journal inside measures 5″ x 7″ and is easily replaced when this one is full. I am selling them for $17 plus $2 shipping. If you live in Illinois I will need to charge 6.25% sales tax. I am going to put some photos up here on my blog. If you are interested comment here on my blog or message me on FB and we can make payment and shipping arrangements. Christmas is coming and these will make nice small gifts for friends and family. Thanks for looking! 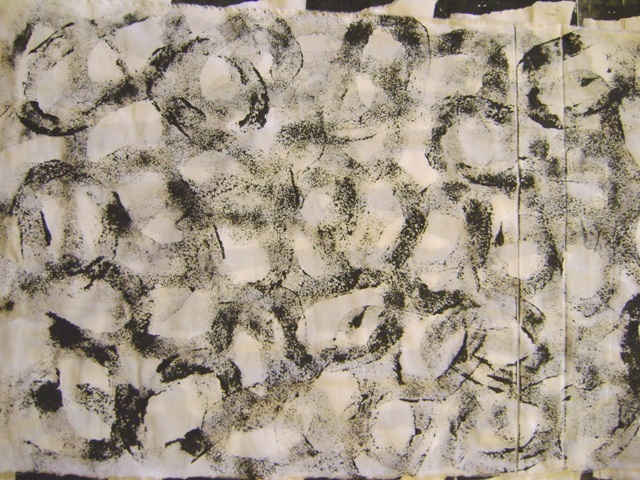 This journal cover is a photo of paper cloth that I recently made. 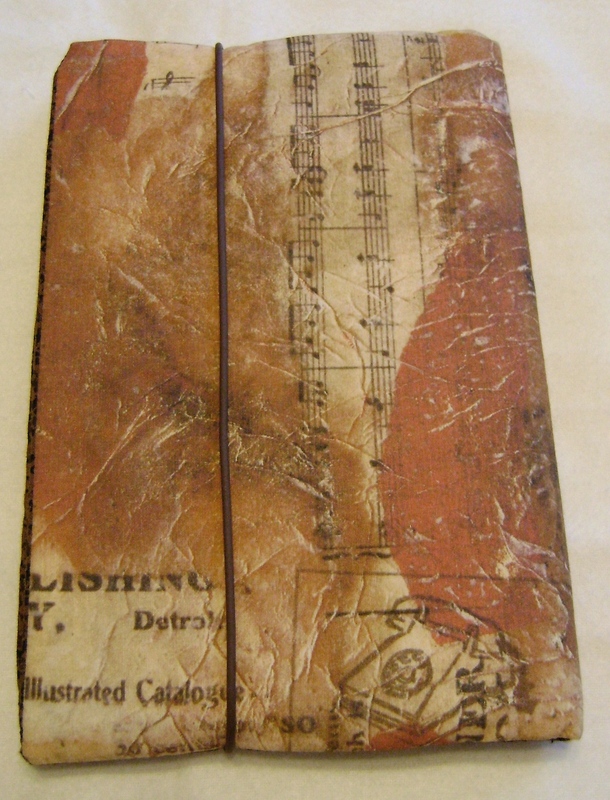 The paper cloth is made with text, sheet music, used coffee filters, pattern tissue, and copper tissue paper. I really love how it came out. After I made the cover, I did a photo transfer with TAP on the front…the photo of the girl is a copyright free image. There is a brown rubber strap for the closure. I have been working this week…instead of blogging. I will be the featured artist at an event called Select Collection in November. The organizer and promoter of the event wants to use photos of Fragments of a Life in her promotional materials. Since I suspect that people will want to see those pieces at the event and since I’m not positive that’s my bestest work of the moment, I have decided to continue the series and have been working on some new pieces. 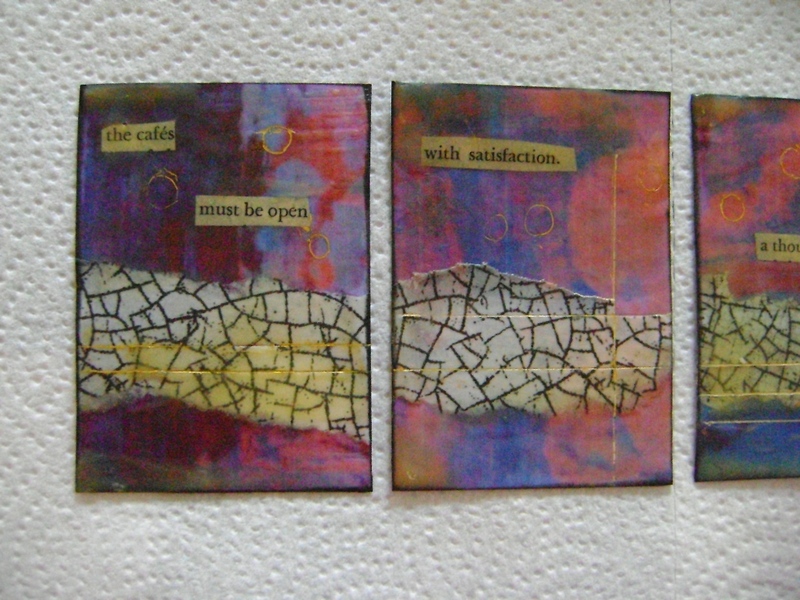 Fragments of a Life #5, pin basted and ready to stitch. 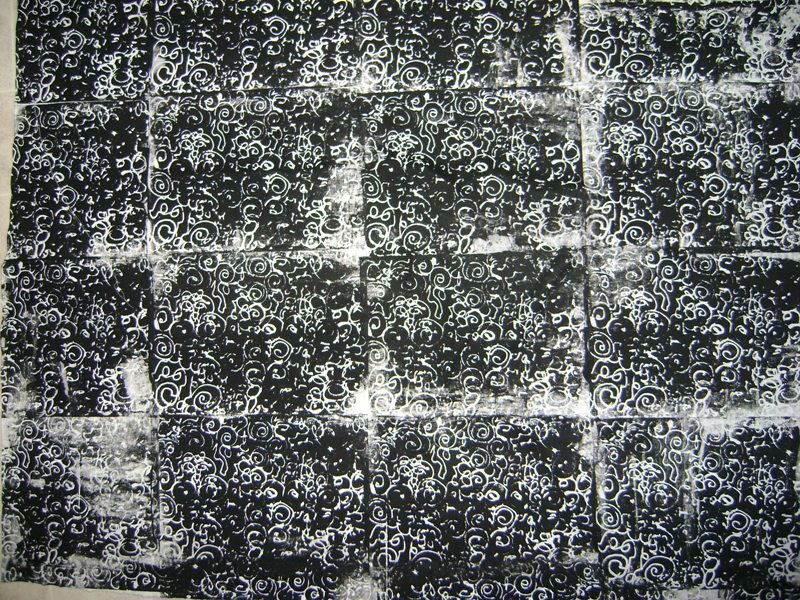 I have also been printing black and white cloth the past couple of days since I had a buyer interested in some. 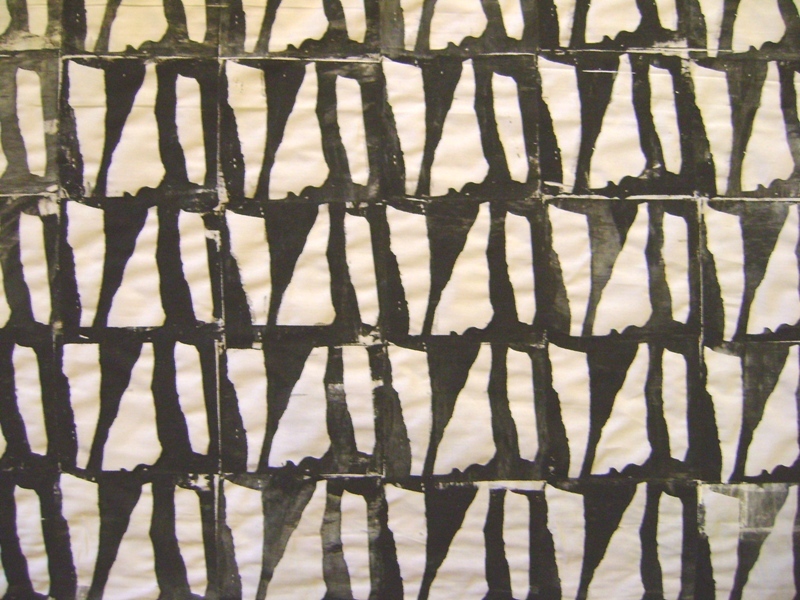 The shortcut way is to use screen printing ink, but I want to do some folded pieces with dye. The heat has been prohibitive here, being over 100 degrees yesterday and today, so I haven’t worked outside which is where I like to work with dyes. If life stays out of the way, I think I can get lots done this month! 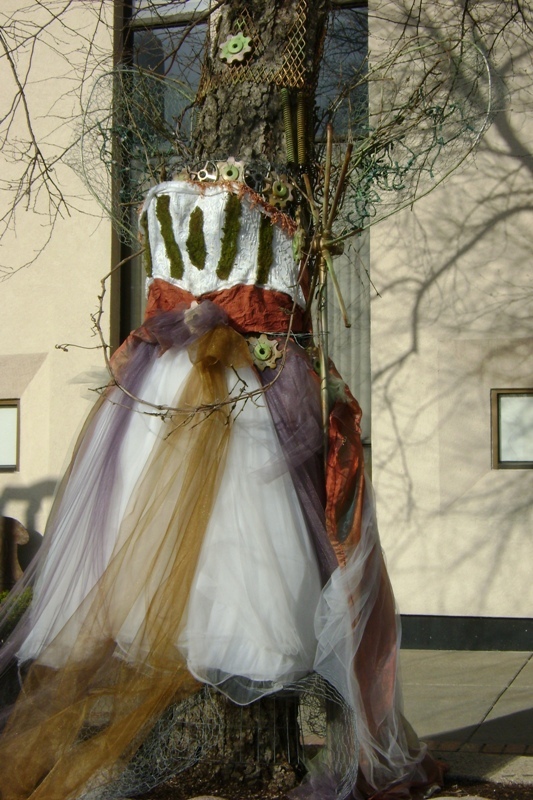 Seen in front of the Art Center in Decatur, IL…a tree in a dress! Yes! It had wings too.